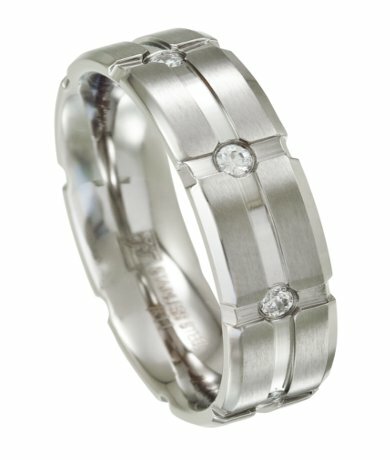 With its luxurious modern look and affordable price tag, this men's stainless steel band is an easy choice. Equally suitable as a contemporary wedding band or fashion ring, this stainless steel ring features a horizontal center cut intersected by vertical grooves and dotted with 8 cubic zirconia. A timeless satin finish and 7mm comfort fit band are perfect final touches. I love this ring!... the ring looks great, plus is very comfortable to wear. Looks great with any look. This ring far exceeded my expectations. It is beautiful and well made. I look forward to future purchases!